* To add a photo(s) to your listing, e-mail me a .jpg file. 03 20 Merc 13 Merc prop. 20 mph @ 5800 rpm (speedo). 05 90 Merc Lowrance/Eagle electronics, Motorguide 4300. 07 90 Merc Optimax the transom. 42 mph @ 5750 rpm (gps). Pro Team 175 17 mph @ 6500 rpm (speedo). 86 150 Merc Thruster TM. 65 mph @ 6200 rpm (speedo). new FX Class Skeeter, lol!!" 08 60 Merc 4 Stroke "Excellent boat as I grow older - had big glass before. underpowered. Also love the 60 hp 4-stroke." 85 115 Merc 40 mph (gps). 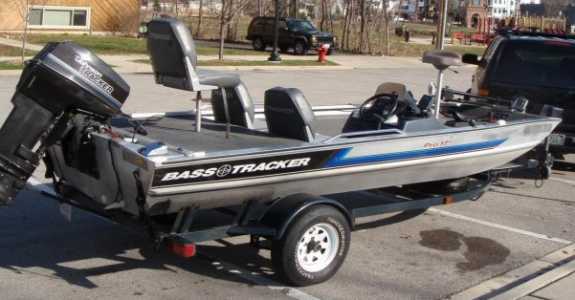 "My first bass boat. Paid in full." props as well, all stainless steel." tank, DualPro onboard charger and two fishfinders. 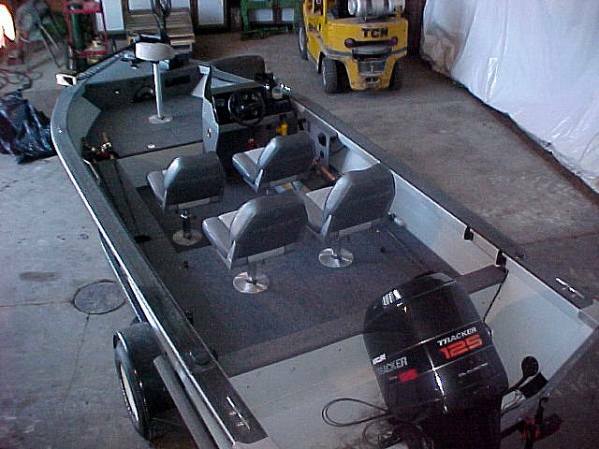 and a more powerful 12V trolling motor." 06 60 Merc 34 mph (gps). "Great boat, looking to upgrade soon." 05 60 Merc 34 mph (gps). 02 40 Merc 42#. 28 mph @ 5000 rpm (gps). "It's been a good boat." 04 225 Merc Optimax electronics, Motorguide 101#. 57 mph @ 5400 rpm. 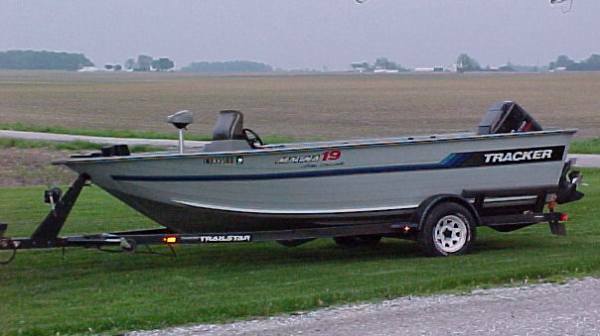 "I love this tournament walleye edition of this boat. PT 190 MinnKota 70#. 43 mph @ 5300 rpm (gps). system with at least 70# of thrust." 01 150 Merc XR6 55 mph @ 5800 rpm (gps). 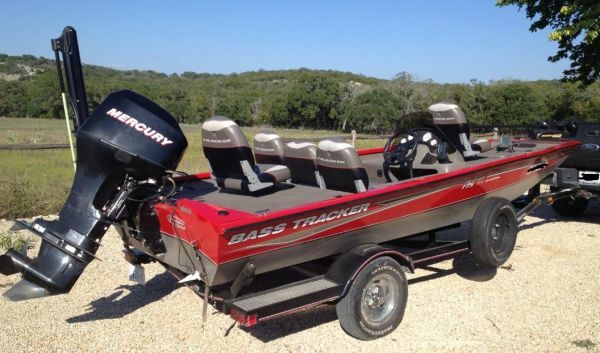 "Great boat for the price. to put a 150 Merc on it. Runs great in rough water. knows how to gain a little bit more speed out of it. work great with both having gps capability." with the original owner new, it's stainless." boat/package. I would appreciate any help." 05 135 Merc Optimax can run at. If so, are you propped differently?" 91 40 Evinrude Wide One Hundred, Motorguide Energy 54# 12V. Starting to think I need a new ride." 03 50 Merc manual, copy or original, will pay reasonable fee." 99 50 Merc reasonable fee." 175 TXW 31 mph @ 5400 rpm. V-17 Spec.Edition "Bought it July 07. It sat in a garage for 7 years unused. pump is not working right now, hope it's an easy fix." 83/95 Mariner 2.4 Wide View, MinnKota Maxxum. 78 mph @ 7600 rpm (gps). a great bunch of anglers that love to lend useful advice." 89 200 Merc It is a Tracker 23 fiberglass cuddy cabin 23.3 foot. Black Max It is a beautiful boat but I can't find any info. Thanks." to mid fifties. Strong motor." Pro Series Pro Series 70#. new batteries for 12/24V trolling motor, any advise?" 89 90 Evinrude run, light to trailer, drafts in a foot of water. Have about $3500 into the whole rig!!" great behind the SUV, has everything you need!" and lockable storage since I bought the boat in March. Also added a 2nd and 3rd battery and charger. 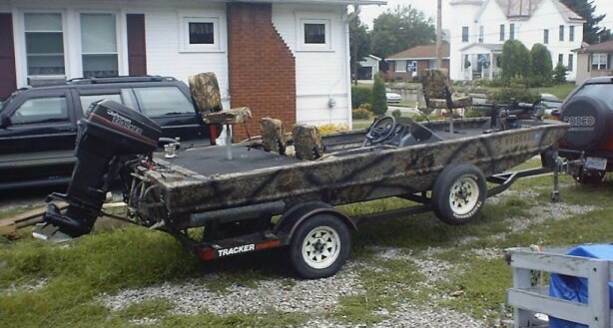 I fish a lot of tournies from this boat and love it!" 05 50 Merc "Not expensive and has everything that I want in a boat. gets me into places longer boats can't get." Tournament TX BottomLine Tournament 1101, Tracker 72# TM. 98 90 Force water yet." 06 90 Merc Optimax 42 mph @ 5600 rpm (gps). 190TX 42 mph @ 5600 rpm (gps). 07 Tracker 17" Merc prop, Eagle Cuda 250 GPS, Motorguide 46. Jim S - ? gear ration is 2:1 on this model." 94 60 Merc MinnKota Edge 70#. 33 mph (gps). 08 60 Merc EFI it moves around a lot in the wind." get 33 mph and 4900 rpm. Any ideas on a new prop? I'm running a stock tracker 19" aluminum." is held in by a plastic spacer and a washer and screw. It does not seem like a very reliable setup." Pro Team 175 46. 32 mph @ 5300 rpm (speedo). 87 150XR2 Merc MinnKota 55 AT. Propshaft is 2" above the pad. 55 mph @ 5600 rpm (speedo). Pro Team 175TX Motorguide 46#. 38 mph @ 4800 rpm (gps). 05 50 Merc MinnKota 70PD w/AP. 36 mph (gps). 99 75 Merc question is a rotary switch that says "empty" and "auto". but this is an additional switch on the side wall. Thanks." 185 XT Motorguide 43#. 48/50 mph (gps). 185 SE 787C2, Motorguide Energy 76#. Pro Team 165 Motorguide 54#. Propshaft is 1/2" below pad. 05 25 Merc 25.7 mph @ 6000 rpm (gps). 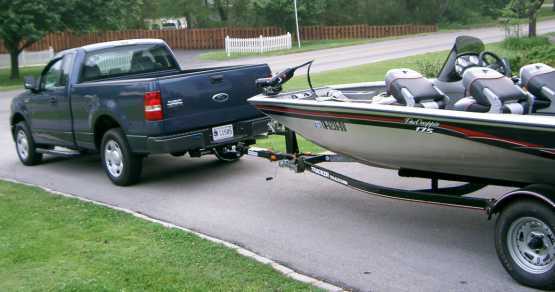 boat for fishing tight places and shallow water." 1710 6060, OMC BFL4TS. Propshaft is 3.75" below pad. own. It is definitely the most fun boat to drive." rpm (gps). "Great boat wouldn't trade it for nothing." experienced the same problem? Any advice?" different up here in Lund/Crestliner country." 05 115 Merc Motorguide 54#. 49 mph @ 5100 rpm (gps). and 52 on the speedo - one of them is probably right. taste) and having it propped for next season. Pro Team 185 (gps). 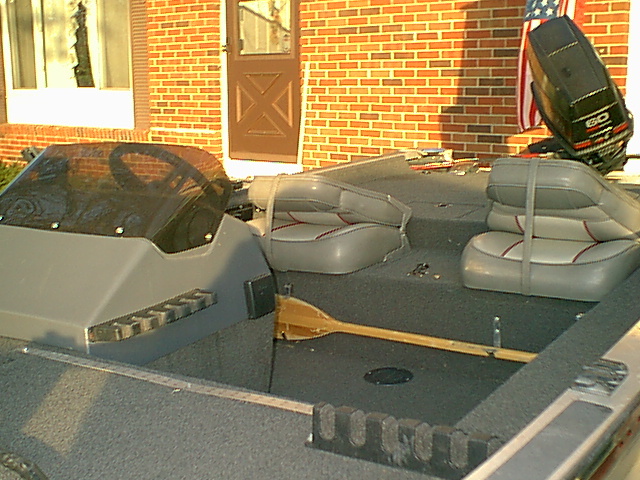 "Has been a great boat since I bought it new. 03 50 Merc Runs about 30-31 WOT with the 50 Merc on it. wet or is it suppose to not let water in?" glass boat. An actualy better ride with the TV18! guess it depends on the dealer!!" 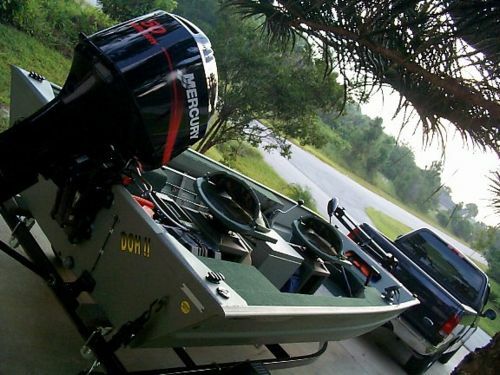 05 60 Merc 4 Stroke chargers, stereo and additional toys." problems? I appreciate any help." satisfied with Tracker (so far)." 89 150 Johnson MinnKota 599M TM. 54 mph (gps). like it just came out of the showroom." trimmed, unloaded, with ideal 1' chop conditions. tanks, both livewells fille, 3 people tons of gear. trade for something else if and when the time comes." (gps). "Nice ride...beats the 9.9 Merc on 12' jonboat". Pro Team 185 Lowrance X47, Motorguide TM. 04 90 Merc MinnKota Deckmate 40 anchor system. Basstracker 3 below the pad. 34 mph @ 4800 rpm (gps). fiberglass boat. Any suggestions would be great. 02 150 Merc XR6 Maxxum 65#. Propshaft is 3.5" below the pad. more of them around. Definitely a well kept secret." Pro Team 175 MinnKota AT55. Motor is mounted in 2nd hole. Tournament V18 MinnKota 74#. 40 mph @ 5000 rpm (gps). 03 90 Merc "Excellent boat for the money, few minor complaints." Pro Team 185 45 mph @ 5500 rpm (speedo). 93 60 Johnaon 50# TM. "Leaks BADLY but I love it anyways." 04 90 Merc Motorguide X54 TM. 43 mph @ 5200 rpm (speedo). 92 40 Evinrude MinnKota 50AT. 36 mph @ 5000 rpm (speedo). marine plywood decking. I am the original owner." and back. Easy loading and unloading!" Tournament 1800 FS MinnKota 55 AT. 62 mph @ 4900 rpm (gps). 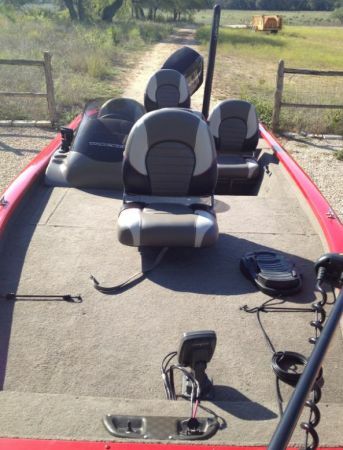 42" livewell, single console, lighted compass." 03 Tracker 12" factory prop. 36 mph @ 5400 rpm. Tom - from ? of the water when I fill the front livewell with approx. experiencing these conditions, I would like to know." that, good boat for the money." at high speed in the rough chop." a user manual for this boat?" Pro Team 185 Motorguide 12/24 Tracker 60 series. to some great fishing trips for the rest of the year." 90 Evinrude Humminbird LC2000, Motorguide TM. 60 Merc BigFoot Hot foot. Deep V 17 Motor is mounted in 2nd bolt hole. both for club tournaments and some open events. but doesn't want two boats." 115 Johnson Eagle UltraClassic II, MotorGuide TM. 41 mph @ 5300 rpm (gps). 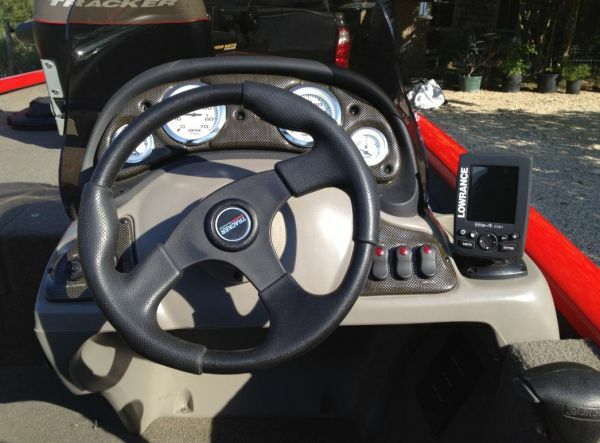 storage, running Garmin gps 176, 15 hp OMC kicker. 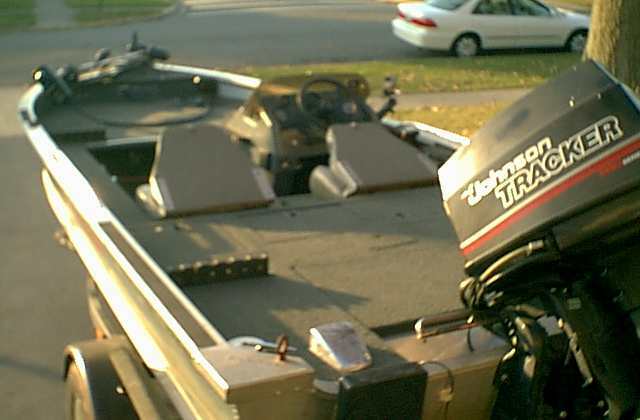 75 Merc Humminbird Wide View, Tracker 37# 12V TM. 40-45 mph @ 5000 rpms (speedo). "Wondering if a small jackplate would help out any. Great holeshot and will be on 42 or 43 in a heartbeat. Want to go to a G3 Hp-180 w/150 Yammy VMax. Great boat for what we do. Thanks Tracker." 185 Jet Tracker Pro 60 TM. 45 mph @ 5200 rpm (speedo). motor for windy days or strong current on the river." 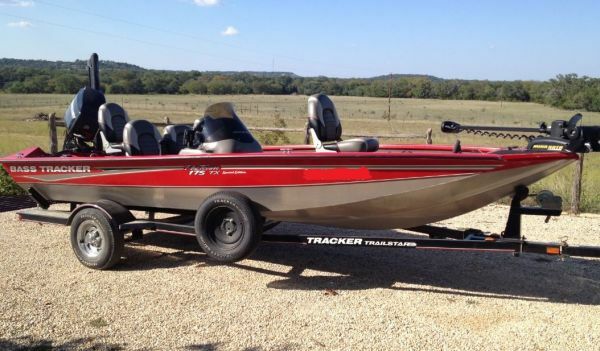 this boat has lead me to a lot of great fishing." 40 Force and recover. Only problem is with power tilt and trim. when it won't raise, no problem with lower. Tournament V-18 Lowrance X91, MotorGuide Pro 67# TM. a little squirrelly at speed in chop." Guide Special V16 Minnkota 50 PD Bow Mount. 27 mph. from a plain 14' aluminum boats/15 hp tiller combo! Am looking for something newer and faster though." Pro Team 185 SE 128 fishfinder, MotorGuide 44# TM. 44 mph. 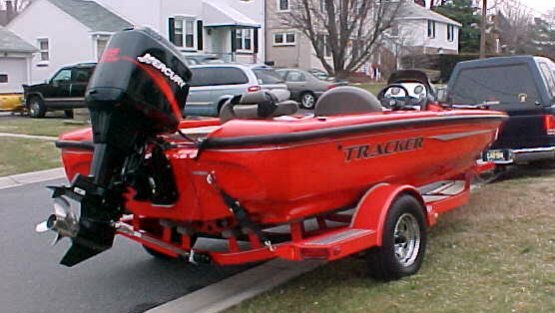 90 Tracker/Merc "Purchased this boat to fish local bass tournaments. mph, starts working again when boat speed is reduced! Any ideas on how to fix this?" 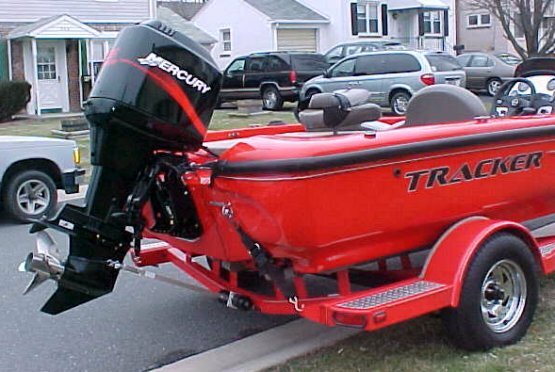 moving transducer to lower step on transom." Pro-Deep 17 MotorGuide TM. 43 mph @ 5300 rpm. (speedo). be removed to open up more room for a third person." Pro Team 175 31 mph @ 5200 rpm (gps). 75 Merc 2 seasons. It is fine for both fishing and running around." Tournament V WideView, MotorGuide 52# 12V. loose easy and after 2 years the screen went blank. welds and wood stepsides are falling apart. my 2nd wife....my Tracker is my first !" 90 Merc Minnkota Maxxum 74# TM. boat. Handles like a sports car. Likes big water." the pad. 46.2 mph @ 5200 rpm (gps). want to guy used. Looking to try a 22" Laser II prop. with 43 mph winds, so I'm happy." Pro Team 175 "Breaking it in. Smooth ride." 75 Merc is very smooth and stable." Tournament V17 Vision, Minnkota AT50 TM. "Nice Tin Boat. 60 Johnson Added lights and radio, full gauges. passenger side will be coming off this spring." accidently turning it on and running the battery down. tilt solenoid which I easily fixed myself. Love my boat! 90 Merc MotorGuide TM. 45 mph @ 5300 rpm (gps). that seemed to have plagued some Tracker owners." Grizzly 16 Bass Lowrance X38 (hate it). Motor is 3" off the transom. summer days here in Florida. 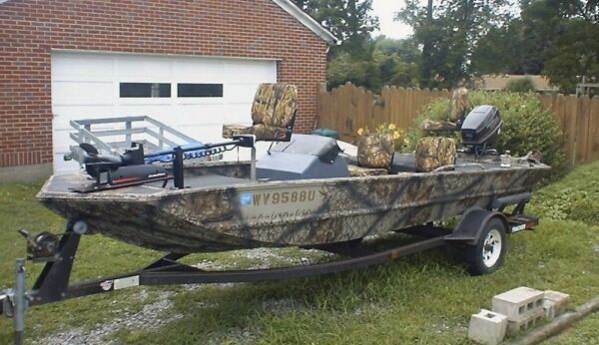 Great hunting/fishing boat. Have added an hour meter and a water pressure gauge. 75 Tracker the boat for 4 weeks, just love the way it performs". 25 Merc 4stroke 24 mph @ 6200 rpm (speedo). rack, planer board setup, canopy. ProTeam 185 43# MotorGuide TM, Humminbird LCD, ELPTO.